We are officially in the full swing of engagement season! This is such a fun and exciting time of year where we get to show our venue to couples and hear about their dream wedding. How often have you gone to the grocery store and forgotten your list? You don’t remember what to buy, do you? The same can go for this type of situation. Prepare a list of your most important questions to bring with you during your tour. You won’t be caught off guard or draw a blank when it comes time to ask the questions that mean the most to you and your special day. The Knot has a great list of questions to start you off. Yes, it’s important to get your loved ones input on your big day. But when touring a venue, having too many people (and their opinions!) can put a damper on your excitement. Instead, take photos and jot down some notes to share with your friends and family later. Don’t forget to check the restrooms, dressing suites, parking area and other often over-looked points of the venue. Ask about any venue restrictions. Can you bring in outside alcohol? What outside vendors are permitted? Do you have have to leave by a specific time? Are there decor restrictions? Before you go on your tour, read up on any reviews. Make a note of any potential issues, and ask the venue their thoughts. Will there be enough parking space for your guests? What if it rains - will the parking area get messy? Is there an area to drop off and pick up guests with special accessibility needs? Of course you’re excited to begin planning and you want to check out every available option! Keep in mind how much time each venue tour may take and factor in travel time in between each space. .
Finding your wedding venue shouldn’t be stressful. If you follow these tips to help ease some of the pressure and enjoy the process. Our Wedding Guide is your all inclusive guide to selecting and planning your wedding at The Colonnade! Be sure to check it out. Contact us to set up your visit. Nana Ama Quansah and Adil Inusah were married on August 4, 2018 -- a little over a year after their engagement. 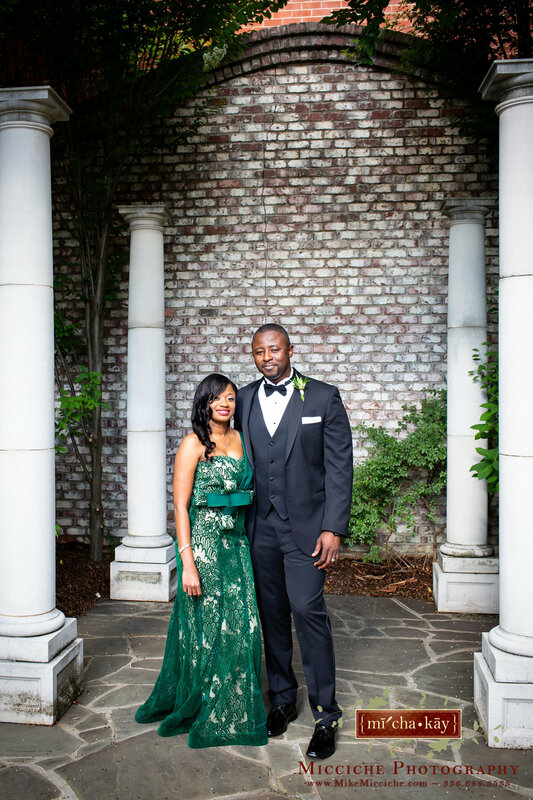 After a church ceremony, the couple hosted their reception at The Colonnade. They describe the entire day as exactly what they wanted – simple, fun, and elegant. Nana’s favorite moment was getting to see her new husband dance! They didn’t get a chance to practice their entrance dance but it turned out to be the highlight of the night. It set the mood for the reception. While the couple didn’t have a specific theme or color scheme, they knew they were going for a romantic and sophisticated feel. “Elegant” was the word that echoed throughout their planning process. The wedding party was seated at two long tables which were adorned with a greenery garland and accented with pale blush and white flowers. Ivory linens, gold chiavari chairs and floating gold candles in different size cylindrical vases finished off the look. The round tables which seated the rest of the guests, featured centerpieces with floating candles, floral wreaths, and mixed greenery. The couple’s favorite part of the meal were the mini crab cakes with a mustard seed remoulade that were served during the cocktail hour. Pepper Moon Catering provided a dinner buffet of tossed garden salad, grilled chicken breast with parmesan cream, marinated grilled flank steak, oven roasted vegetables and smashed potatoes. The couple was drawn to The Colonnade because of both the pleasant staff and the architecture. They cited the enormous windows, bricks, and courtyard as influencing factors in their decision, saying that the courtyard makes for some amazing photos! Once you’ve said “yes,” wedding day prep can become a bit of a whirlwind. All of a sudden you’re faced with a million small decisions – it’s not just picking the dress, it’s picking what kind of table cloths will be used, what time the ceremony will be, organizing a seating chart, and hiring a whole team to help you pull off your special day. To help you enjoy the build-up to your special day, we’ve pulled together four must-use wedding resources that can help you make it all happen… with minimal stress. WeddingWire is here to take the stress out of planning your big day – they have tools available for picking your wedding date, planning your seating chart, determining your budget, and managing vendors. They also have a huge database that lets you search vendors by location. You can browse for everything you need, including venues, photographers, officiants, bands, jewelers, wedding planners, and more. Need inspiration? Pinterest is not the only place -- you can get all the inspiration you need on Wedding Wire. You can browse dress styles, check out the user forum, or take advantage of their expansive blog. If you’re feeling a bit overwhelmed, The Knot even has a free quiz to help you define your wedding day style. After you take the quiz they’ll help guide you to the right vendors to make your vision a reality. Looking to get more local? TriadWeddings is a premier wedding resource and planning guide in Greensboro. Browse local wedding resources or download their free local wedding guide. One of our favorite parts is The Real Weddings section, where you can browse photos of other area couple’s weddings. Sometimes deciding which vendor to opt for can feel like a real stab in the dark. However, the Triad Bridal Association takes the guesswork out of picking a vendor. When you hire a Triad Bridal Association member, you will be working with one of the area’s top wedding professionals. Someone with plenty of experience, who is not learning on your wedding. All of the Members adhere to a Code of Ethics, and you’ll breathe easy knowing that you (and your wedding) are in good hands. 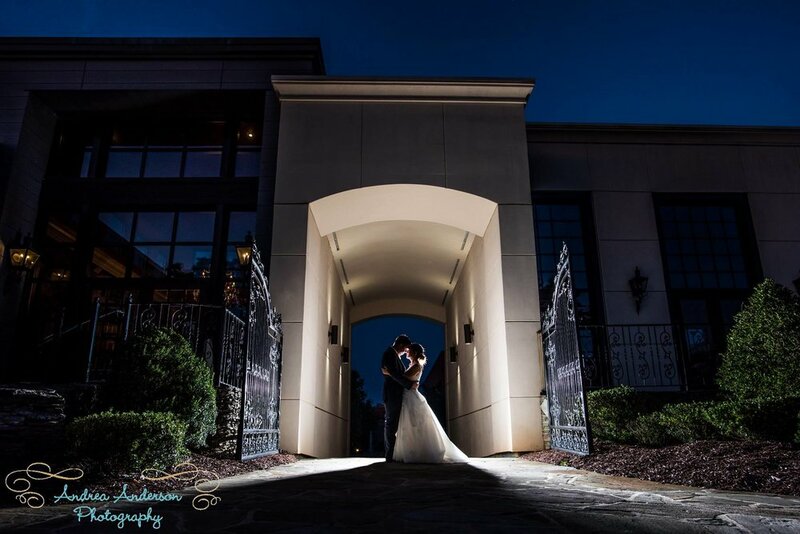 Revolution Mill Events and Pepper Moon Catering are proud members of the Triad Bridal Association! They’ve also got a section dedicated to local wedding shows where you can even snag a discount on a future show! Evernote: If you’re looking to stay organized, this app (available on desktop and mobile) will keep everything on track. You can make multiple notes/notebooks, add pictures, or set reminders for yourself. Google Docs: Check out all the tools available with your Google account! You can use Google Drive to store photos, Google Sheets to make spreadsheets of vendors, and even Google Forms to gather RSVPs. All of your files will be easily shareable and available on your mobile and desktop. If you’ve narrowed down your venue to The Colonnade, we provide a free wedding guide to walk you through everything you need to know about our venue. You can get an idea of a typical timeline, find answers to frequently asked questions, and see what’s included with your rental. If you’re ready to start planning your reception food and drink, you can view Pepper Moon’s Catering menu HERE. 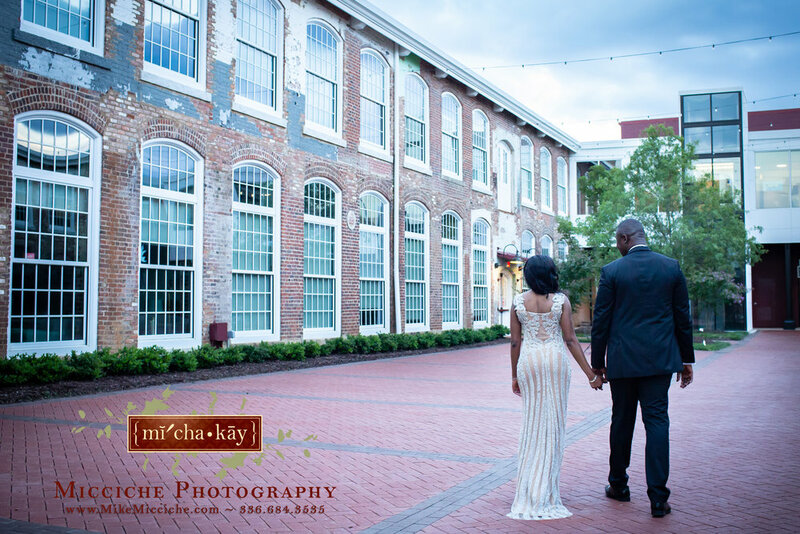 The following article was written by Jaime Gilliam, Venue & Catering Manager for Revolution Mill Events, and was originally published in Triad Weddings in August 2018. Your wedding dinner is a celebration of the first meal shared as newlyweds and an expression of appreciation for your guests. Because of it’s significance and the variety of catering options available, you may find it challenging to decide what to serve for your reception. Instead of worrying about the particular dishes to be served, begin with thinking about the style of meal you want. This decision will impact the structure of the reception and likely the food you choose, so it’s a great place to start. Let’s take a closer look at three key serving styles for wedding reception food: plated, buffet or hors d’oeuvres stations. TIP: Ask guests to initial their entrée selection on the RSVP card so you’ll know which entrée to indicate on their place card. Guests are seated then served all courses by the catering staff. It’s common to offer salad, entrée and dessert (wedding cake or other) courses, but for more formal occasions you could consider additional courses along with wine pairing. Plated meals are a good option for both intimate and formal gatherings. To provide more variety, you can offer several entrée options on your RSVP card or a dual entrée plate. A variation on the plated meal is family style, where platters of food are brought to the table and passed around by the guests. TIP: Talk to your caterer about their preferred plan for dismissing tables to help keep a smooth guest flow. They will work with your coordinator or DJ to efficiently move guests and prevent a long line. A buffet is set in one central area and will display your food selections for guests to self-serve. There are many variations from casual BBQ to semi-formal. In the Triad, we have seen buffets as the traditional preference over the years. TIP: When selecting your stations, make sure your menu contains at least one protein, starch and vegetable to comprise a typical meal. Choose heartier items to fulfill guests during the dinner hour. This style of service provides small plates of a variety of hors d’oeuvres spread out into multiple stations. Your guests will remember the fun interactive displays (think - mashed potato bar, salad station or mac and cheese bar) and chefs cooking on site (think - gourmet grilled cheese with soup shooters, carving station, fired ahi tuna or pulled pork tacos). If you are still struggling to figure out which service style would be best for your wedding reception, reflect on your vision for the big day. Your catering selections are the perfect place to express your unique personality. Consider the best option for your number of guests, those in attendance and your budget. It’s an honor to create a memorable reception where you get to share a meal with all the people in your life that matter most! The following article was written by Jaime Gilliam, Venue & Catering Manager for Revolution Mill Events, and was originally published in Triad Weddings in January 2018. Selecting your wedding venue is one of the first major decisions you’ll make as an engaged couple. Your venue sets the tone for the rest of your plans and will likely comprise much of your wedding budget. Consider the following tips to help you confidently make your decision and reduce planning stress! Know your approximate guest count, wedding date options and approximate budget before starting the search. Your venue lays the foundation of telling your unique love story on your wedding day. Chat with your fiancé and other decision makers about the style and aesthetic you have in mind. Are there any essential features the space must have? Use online resources and Triad Weddings to find local wedding venues. You should be able to narrow down options by the framework you set in the previous tips. Each venue has its own character and charm, and a site visit will help you determine if it is the right fit for you. Save time and find out as much as you can about a venue before you go visit. Contact your top picks in advance to set up a personal tour. Document the details by taking notes and snapping photos to help you make comparisons. Gather as much information as possible! How long is the venue rental? What amenities are included, such as tables, chairs and linens? Are there any décor or grand exit restrictions? Are there enough parking spaces and restrooms to accommodate the guest count? Does the venue itself photograph well and provide pretty portrait spots? What will the overall guest experience be like? Since catering goes hand in hand with your venue, it’s important to consider options during the early planning stages. There are several benefits to choosing a venue with an exclusive caterer. The venue and catering team will work together seamlessly. You’ll typically have one point of contact to coordinate the venue, catering and rental details which makes things easier for you. However, if there is a certain caterer you’d like to work with or you have a specific vision in mind (like food trucks), you’ll want to look for a venue that allows outside vendors. The frustrating thing about the wedding venue search is that you’re usually comparing apples to oranges. All venues include distinctive services and packages, so as you research, try to organize the information in a way that’s easy for you to understand and compare. As true with most decisions, if something feels right (or on the other hand, doesn't feel quite right) you should trust your instinct! Look at the big picture - while you may not like every single thing about the venue, if the pros outweigh the cons it’s likely a good fit for you. Make sure you feel comfortable with the staff, as they are going to be the ones to ensure your day runs smoothly. Be sure to check out online reviews! Request a contract and take the time to read it thoroughly. Confirm your agreement of date, times and details to be provided by the venue are in writing. Be sure to understand all the terms, fees, restrictions and cancellation policy. Now it’s time to sign the contract and pay your deposit to officially lock in your date! Congratulations, you can check this important step off your planning checklist! Your remaining details will start falling into place now that you’ve made this big decision.